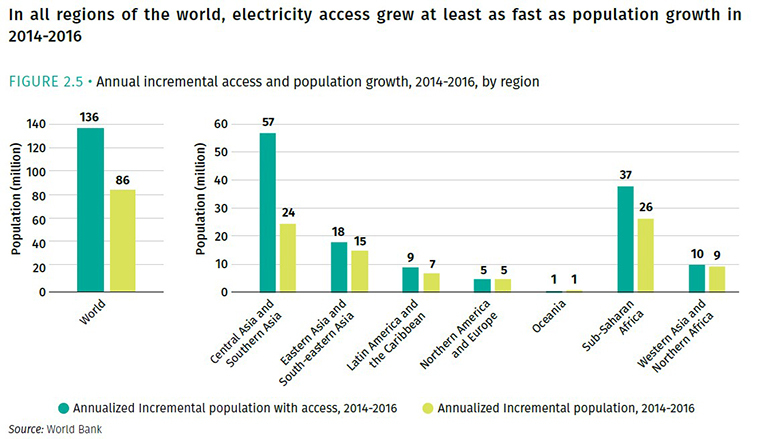 Is the world on track to deliver energy access for all? Do you have access to reliable electricity at home, at an affordable price? And how is the stove you use – is it an electric one, or does it rely on wood or coal, generating smoke every time you cook? One billion people (13% of the world’s population) still live without electricity and more than 3 billion (41%) use polluting fuels to cook, undermining their health, productivity, and quality of life. That’s why the United Nations placed universal access to electrification and clean cooking technologies among the energy-related targets to be reached under the Sustainable Development Goals (SDGs) by 2030. Additionally, SDG #7 calls for a substantial increase in the share of renewable sources (solar, wind, hydropower and geothermal, for example) in the global energy mix, as well as for a more efficient use of energy. A new report, Tracking SDG7: The Energy Progress Report 2018, provides a snapshot of the world’s advances towards the targets on access to electricity, clean cooking, renewables and energy efficiency. 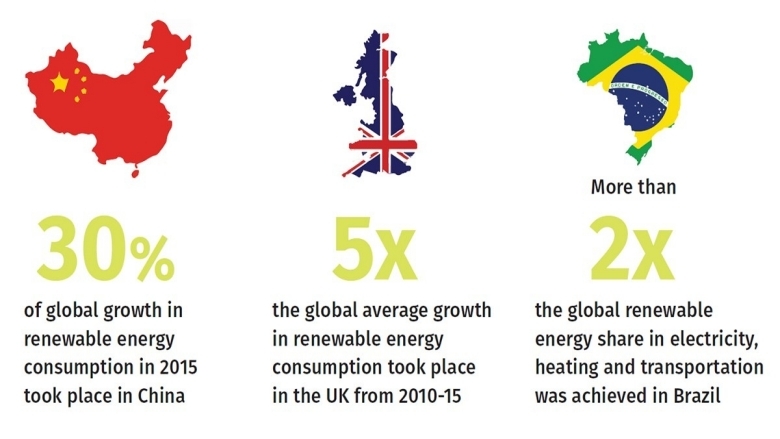 And while the study shows the world is not on track to meet the global energy targets for 2030, it also highlights recent experiences that offer encouraging signs – mostly in Asia and Sub-Saharan Africa, but also in Latin America. The report is a joint effort of the International Energy Agency (IEA), the International Renewable Energy Agency (IRENA), United Nations Statistics Division (UNSD), the World Bank, and the World Health Organization (WHO). In Latin America, nearly three-quarters of countries are on track to attain universal access by 2020, and by 2030 the region is expected to achieve near universal access, with Haiti the only country with an access rate below 90%. More good news comes from Africa, which in recent years saw electrification outpace population growth for the first time. Ethiopia, Kenya and Tanzania increased their electricity access rate by 3% or more annually between 2010 and 2016. Meanwhile, India provided electricity to 30 million people annually, more than any other country. However, there is still much work to be done to meet the SDG target for electrification. If the current access trends continue, 8% of the global population will still be in the dark in 2030. “The experience of countries that have substantially increased the number of people with electricity in a short space of time holds out real hope that we can reach the billion people who still live without power,” says Riccardo Puliti, Senior Director for Energy and Extractives at the World Bank. 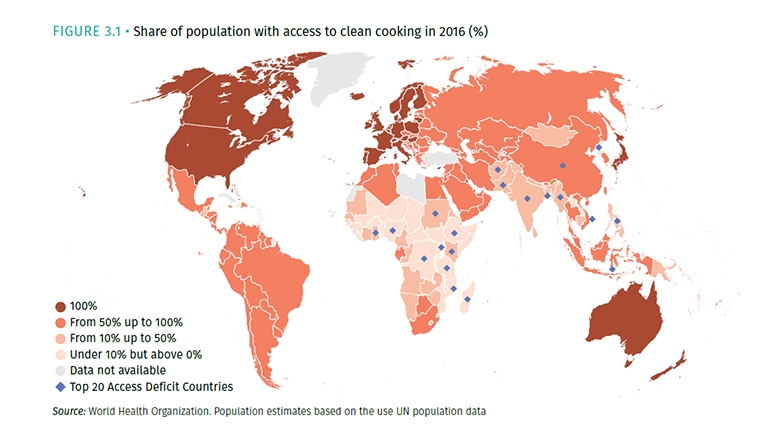 Of all the four energy targets set up in the Sustainable Development Goals, access to clean cooking technologies lags the furthest behind: if the current trajectory continues, 2.3 billion people will still be burning wood, coal and other types of biomass in 2030. These traditional methods generate household air pollution, which is responsible for some 4 million deaths a year – more than HIV and tuberculosis combined –, with women and children at the greatest risk. Progress has been slow due to low consumer awareness, financing gaps, slow technological progress, and lack of infrastructure for fuel production and distribution, according to the report. Among the relatively few strong performances that stand out globally, are Indonesia and Vietnam, which provided access to an additional 3% of their populations each year from 2010 to 2016. The report also highlights that, of the 20 countries that made faster progress between 2010 and 2016, four of them are in Latin America: Guyana, Peru, El Salvador and Paraguay. While Sustainable Development Goal #7 does not provide a fixed target for renewable energy, it calls for a “substantial increase” in the share of renewable sources in the global mix. Based on current trends, the renewable share is expected to reach just 21% by 2030 (from 16.7% in 2010), falling short of the increase demanded by the SDG7 target. Transport and heating, which account for 80% of global energy consumption, still need to accelerate progress. In transport, for example, renewable energy consumption reached only 2.8% globally in 2015. The greatest areas of concern remain in aviation, rail, and maritime transport, where penetration rates of biofuels are negligible at the present time. Whereas in heating, traditional use of biomass (such as fuelwood and coal) still accounts for 65% of the share of renewable energy. Electricity represents the remaining 20% and has experienced better results thanks to the declining costs of wind and solar power. In this particular sector, the renewable share amounted to 22.8% in 2015. Hydropower remains the dominant source of renewable electricity, but wind power grew most rapidly from 2010 to 2015. In Latin America, Brazil stands out for more than doubling the global energy share in electricity, heating and transportation. Improving energy efficiency means being able to produce more with less energy. And evidence shows that economic growth and energy use are increasingly uncoupling. Between 2010 and 2015, global gross domestic product (GDP) grew nearly twice as fast as primary energy supply. 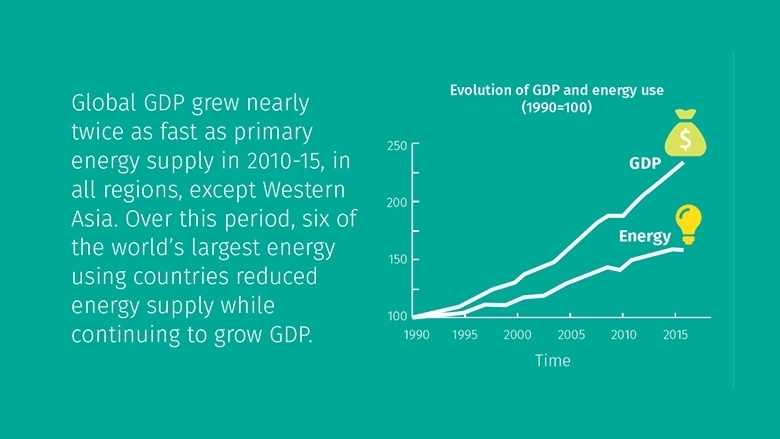 Economic growth outpaced growth in energy use in all regions, except for Western Asia. One of the most important metrics for this SDG target is energy intensity – the ratio of energy used per unit of GDP –, which fell at an accelerating pace of 2.8% in 2015, the fastest decline since 2010. This improved the average annual decline in energy intensity to 2.2% for the period 2010-2015. However, performance still falls short of the 2.6% yearly decline needed to meet the SDG7 target of doubling the global rate of improvement in energy efficiency by 2030. Industry, the largest energy consuming sector, also made the most rapid progress, reducing energy intensity by 2.7% annually. However, advances in the transport sector were slower. As with renewable energy, this sector will be key to ensuring progress towards a low-carbon energy future. This entry was posted in WBG News & Reports and tagged Countries, Energy, Renewables, SDG, TS Energy, Wereldbank Groep, World Bank Group by NL4WorldBank. Bookmark the permalink.